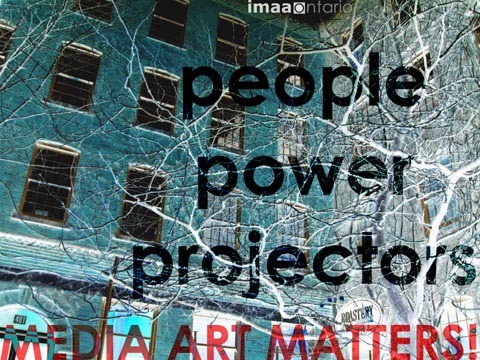 The Media Arts Net­work of Ontario/Réseau des arts médiathe­ques de l’Ontario is a grow­ing arts ser­vice orga­ni­za­tion pro­vid­ing pro­fes­sional devel­op­ment, net­work­ing, and advo­cacy for the province’s media arts sec­tor. Recent­ly award­ed a three-year Tril­lium Foun­da­tion grant, as well as a num­ber of project grants, the orga­ni­za­tion will host a bi-annu­al sym­po­sium in Ottawa in Novem­ber of 2013, as well as under­tak­ing new province-wide ini­tia­tives. Click here to view the full post­ing. Join the Images Fes­ti­val and the Media Arts Net­work of Ontario (MANO) for a pint and an old-school debate about artis­tic license and appro­pri­a­tion in the open source era. Does the artist have the unlim­ited right to appro­pri­ate the works, words, images of oth­ers in the name of art? Let the debate begin…. Monarch Tav­ern, 12 Clin­ton St.
Wente, TIFF’s Head of Film Pro­grammes. Inte­grated Media pro­gram at the Ontario Col­lege of Art and Design. Mike Hool­boom: film­maker, video artist, writer and crit­ic. exhibit­ing at The Pow­er Plant as part of Images Fes­ti­val). Our esteemed pan­el of artists and schol­ars will be mod­er­ated by Jesse Wente, TIFF’s Head of Film Pro­grammes. Keep up-to-date with MANO-RAMO’s ongo­ing activ­i­ties by sub­scrib­ing to our new month­ly newslet­ter! Con­tact director@mano-ramo.ca to add your name to the list. The date is set! MANO/RAMO’s Annu­al Gen­eral Meet­ing will take place on Fri­day, Jan­u­ary 11th, from 1–4pm. The loca­tion is Stu­dio 408, 401 Rich­mond St. West, Toron­to. Refresh­ments will be pro­vid­ed! Lim­ited trav­el sub­si­dies are avail­able, with pri­or­ity giv­en to regions in the north. Please con­tact Ker­ry Swan­son at director@mano-ramo.ca to express inter­est and approx­i­mate fund­ing need­ed. An inter­na­tional event that aims to eval­u­ate the per­for­mance and promise of con­tem­po­rary artist-run cen­tres and ini­tia­tives.